In that beta version we have improved Framework 7 – and it’s better than ever! We have made a lot of changes like performance optimization, rendering speed, content blocks, grid, more text editable elements, current elements polishing, and so on. Framework 7 list items are now draggable in the App Structure tree! Some general improvements were made: the inline text editing is now better with multi-line editing, as well as improved the speed of inline text editing greatly optimized. Of course, bugs were fixed. 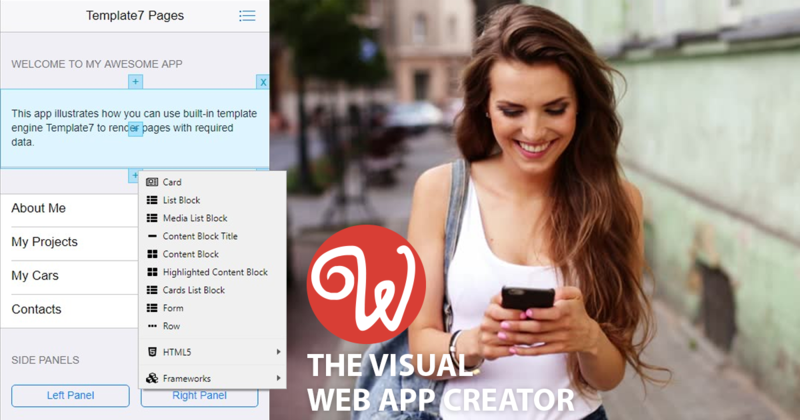 No more mockups – build your mobile apps with Wappler! This app looks interesting but when is the public beta, pricing and licensing information to be released? This is like watching paint dry or getting your teeth pulled ;-). Also the main site is really plain with virtually no information, why such mystery about everything? I agree with Bart. I’ve been a DMX zone customer for about 12 years. Been waiting for some information to come out about it. Was super excited in the beginning, but I think now I’m starting to loose interest in it. Why not just let us know? Will our extensions that we’ve already bought still work work with this? Hi guys and thanks for your comments! Yes, we’re working really hard to deliver you not just a website builder, but the most advanced one! We want our users satisfied and excited about our product. That’s why we decided to extend the public beta period – in order to get opinions and fix all the bugs, as well as add wished components. And we’re doing it! Don’t worry about DMXzone’s extensions – they will remain supported and there still be new releases… but the most exclusive new extension releases will be Wappler-only. Our team will suggest DMXzone’s users special offers for switching to Wappler, believe me! Please stay tuned and wait for the public beta – it will be released in the next month. Remember, Wappler will definitely catch your attention!